look at the stars. All the stars will be wells with a rusty pulley. By the window, watching cars, waiting, willing you home. her own rumbling rhythm on our laps. That evening she ran free, she never came home. Her chirps a witch’s charms that only I understood. Caught in your fishing lines like a magical carp. As her arrival. I cried bitter water. Blaming you. The currents tore an oar away. Waves smashed a log into the boat. I love the water but never learned to swim. Enraptured, snared by dreams, drinking our story. Anxious look as a cat’s plea for affection. As warm, as close, as lonely as before. With a master’s in English literature, Adele Gardner has twice won third place in the Rhysling Awards of the Science Fiction Poetry Association. Her publications include a poetry collection (Dreaming of Days in Astophel) as well as 225 poems and 40 stories in venues such as Legends of the Pendragon, The Doom of Camelot, Strange Horizons, American Arts Quarterly, Silver Blade, Daily Science Fiction, and more. Two stories and a poem earned honorable mention in The Year’s Best Fantasy and Horror. Adele also serves as literary executor for her father and mentor, Delbert R. Gardner. Learn more at www.gardnercastle.com. 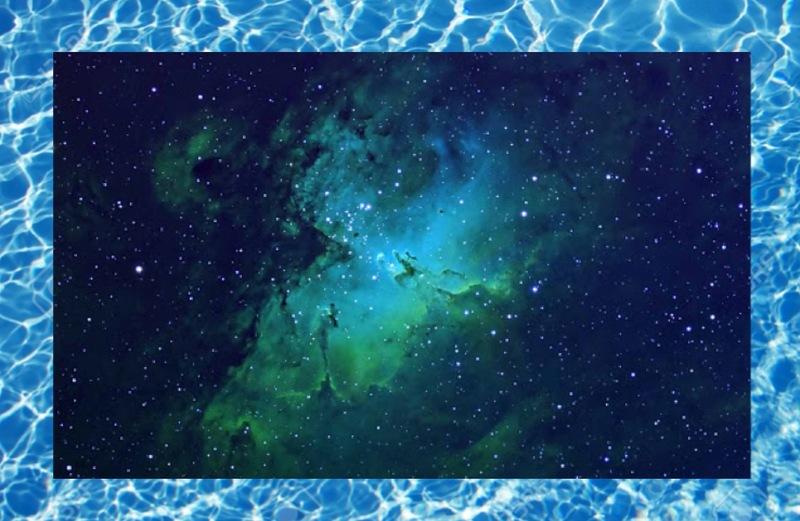 Editor’s Notes: The free wallpaper image (Gambar Bintang – Pemandangan Luar Angkasa/Star Pictures – View Space) of a nebula is matted by a stock photo of beautiful clear pool water reflecting in the sun (Fedor Selivanov).